Shichahai Shadow Art Performance Hotel (什刹海皮影文化主题酒店). Charming little 4* hotel in the midst of the Hutong alleys. You can book it here. 12 minute walk from Subway Station Beihai Bei on line 6. They play shadow art performances on evenings and offer dumpling making lessons. Great for kids as well! You should not visit Beijing without eating the famous Beijing Roast Duck. Da Dong (大董烤鸭) has branches in Beijing and Shanghai and serves delicious ducks. One branch e.g. is at the Jinbao Street 88 (inside Jinbao Mall). Subway Station Dengshikou on line 5. For Dim Sum head to one of the Din Tai Fung branches, e.g. in the Grand Pacific Mall. Metro Station Xidan on line 4. A nice area for Chinese restaurants lies at Houhai – one of the pretty lakes where you can find a lot of small bars and restaurants. Kongyiji is a more upscale big restaurant which serves great dishes. Beijing Subway runs very smooth. A one-way ticket costs between 3 and 5 kuai in the central areas. Subway Map. Tiananmen Square and the Forbidden City are one of the top sights, that should not be missed. It is nice to have a guided tour which tells you a little about palace life. The Summer Palace is a huge garden and court complex. Bring some time, here are some good infos on cost and suggested routes. The Lama Temple is worth a visit for some Tibetan style interiors. It features an impressive 18m Buddha statue made of one single tree. Subway Station Yonghegong on line 2+5. The Confucius Temple is just a short walk away from the Lama temple. You can also visit the Imperial college with its Jade Pavilion close-by. Stroll in the traditional Hutong alleys. Travelchinaguide shows a good overview here. The Mansion of Prince Gong lies in the Hutong area and is said to be a very nice sight. Unfortunately, it was closed when we were there. For some relaxed park time visit Beihai park. You can rent a pedal or battery boat and cruise along (not around) Jade island with its white Dagoba and the Circular City. For the evenings a visit of Beijing Opera, Chinese Acrobatics or Kongfu is fun. 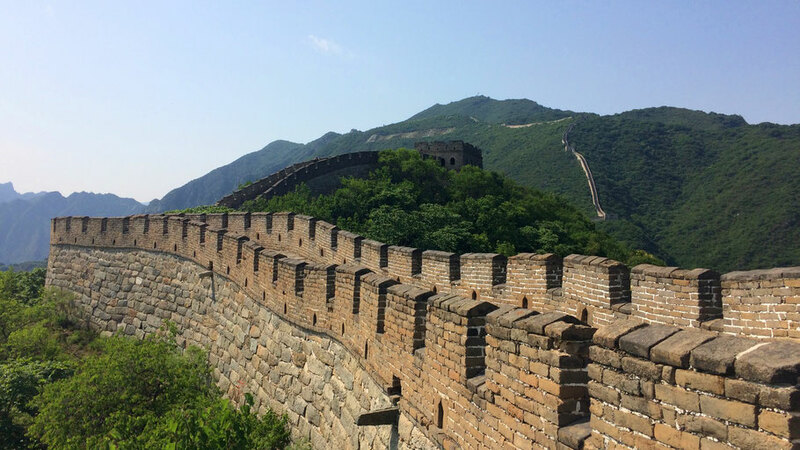 And of course: Don‘t miss the Great Wall! The Mutianyu section is very nice and less crowded than e.g. Badaling. Looking for more sights? Here is a helpful overview. For some practical tips on China (websites, apps etc.) click here.